The period between 211 BC and 146 BC was crucial for the Roman Republic, and for numismatics as well. In 211, the denarius was introduced and produced in enormous quantities from the silver captured in the sack of Syracuse the year before. Early denarii weighed 4.5g, but during the course of the next 40 years the weight was slowly reduced to 3.7g. Politically, this period saw Rome defeat Carthage - a formidable enemy - conquer Illyria, and fight a series of wars in Macedonia and Greece which ended with the subjugation of that ancient civilization. When Carthage was finally destroyed in 148 BC, the Roman Republic had gone from upstart to the undisputed master of the Mediterranean - Mare Nostrum, Our Sea'. 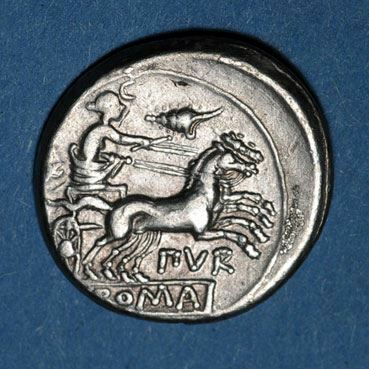 Reverse: The Dioscuri riding right; L•ITI below, ROMA in exergue.